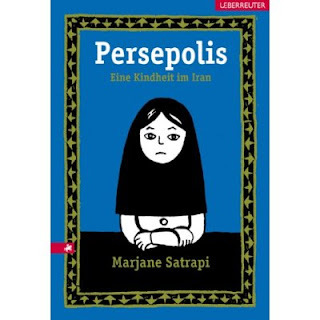 In "Persepolis" Marjane Satrapi tells her autobiographical story of growing up in Iran during the Islamic Revolution. The book is exciting and frightening at the same time - and despite telling a personal story I had the chance to learn a lot about Iran and it's history.The illustration is kept in black and white and in combination with simple and straight pictures Marjane Satrapi found an original and appealing way of presenting her writings. Marjane Satrapi's Persepolis is an exemplary autobiographical graphic novel, in the tradition of Art Spiegelman's classic Maus. Set in Iran during the Islamic Revolution, it follows the young Satrapi, six-year-old daughter of two committed and well-to-do Marxists. As she grows up, she witnesses first-hand the effects that the revolution and the war with Iraq have on her home, family and school. Like Maus, the main strength of Persepolis is its ability to make the political personal. Told through the eyes of a child (as reflected in Satrapi's simplistic yet expressive black-and-white artwork), the story shows how young Marjane learns about her family history and how it is entwined with the history of Iran, and watches her liberal parents cope with a fundamentalist regime that gets increasingly rigid as it gains more power. Outspoken and intelligent, Marjane chafes at Iran's increasingly conservative interpretation of Islamic law, especially as she grows into a bright and independent teenager. Throughout, Marjane remains a hugely likeable young woman.